From floral arrangements to family, wedding season can equal stress. Finding time to eat well + workout can seem overwhelming. Join Jenny Yoo for an exclusive in-store Wedding Wellness event, focusing on simple strategies for how to manage stress levels. helping you look + feel your best. A 30-minute yoga class led by Gratitude Yoga founder Lisa Scurlock will be followed by a 30-minute nutrition discussion led by River North Nutrition founder Maya Bach. Light bites + beverages will be served. $10 per person cash paid at the door or online here. Please plan on bringing your own yoga mat. SIGN UP to sip, flow and jam out to your favorite vinyl. JOIN US FOR AN EVENING OF MEDITATION IN MOTION CO-LED BY LISA SCURLOCK AND MELISSA CONRAD. COME EXPLORE THE MIND-BODY CONNECTION BETWEEN MOVEMENT AND MUSIC THROUGH A UNIQUE DANCE-INSPIRED MEDITATION, YOGA FLOW, AND PERSONAL REFLECTION. YOU WON'T WANT TO MISS GRATITUDE YOGA'S MOVE WORKSHOP. JOIN US FOR SOME vinyl. AND A WHOLE LOTTA vinyasa. Join Kerry Cragin of R E S E T and Lisa Scurlock of Gratitude Yoga for a new look at new years resolutions. If you're like many of us, you may already be busy planning your healthy recipes, work-out routines, and maybe beating yourself up for not ending 2016 just as you imagined. That's exhausting! Kerry is a mindfulness coach, mental health and yoga therapist who specializes in helping people create more calm in their lives. This interactive workshop will teach you more awareness around your own stressors, habits and the ruts you fall into, and then guide you to create more intentional direction to build your best self for the new year. We'll explore themes of gratitude through a juicy flow, followed by a guided chakra inspired meditation in restorative poses to help you dig deeper into how you can make 2017 a year of self-compassion, thankfulness and forgiveness for yourself. We'll end the workshop putting ideas down on paper and you'll walk away with a special gift to keep attention on your intentions throughout the year. Lisa Scurlock and Katie Henry are coming together once again to team teach! We will lead you through a workshop for discovering what you want most out of life. We will set the foundation of gratitude, open our bodies physically through yoga, enhance the yoga practice with essential oils to ground us into our foundation, and then open our souls through some Desire Map work, journaling and discussion. Based on the best-selling book The Desire Map, we get straight to the heart of the matter: How do you want to feel? Slow down, breathe and reflect on what you are grateful for. Enjoy a candlelight vinyasa flow class to vinyl records. 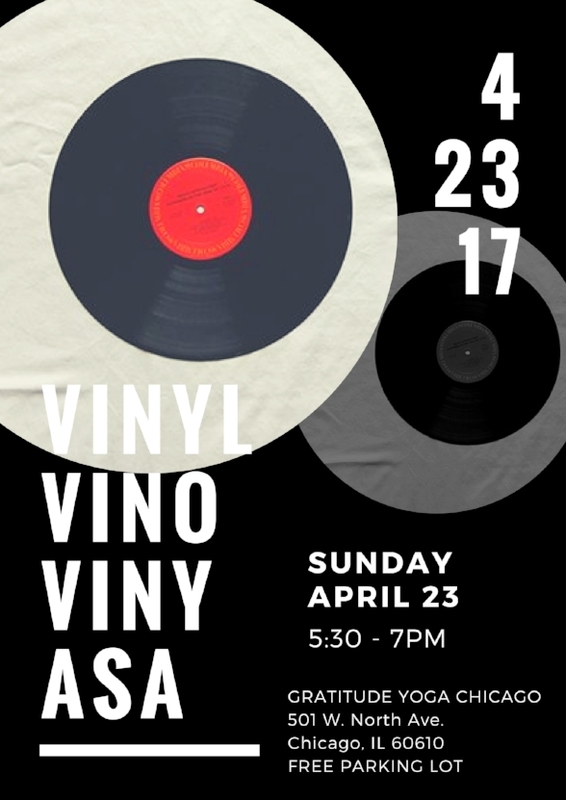 A live DJ will be spinning our favorite tunes on vinyl as we yoga the night away and conclude the evening with a vino tasting. September is Yoga Month and what better way to celebrate one of the most memorable days in America, 9 / 11, than with some yoga. Join Gratitude Yoga and Sprinkle Cheer for our event, UNITY in CommUNITY. unplug from your devices, listen to live music, practice yoga on your mat, enjoy the sensational skyline, drink wine & be merry. $10 Donation - Proceeds go to the Haitian children. Show up as you are and there will be a gratitude jar. February is the month of LOVE…bring your loved one, listen to love songs to practice GRATITUDE and practice YOGA. Join us at gratitude yoga for a candlelight vinyasa flow class to vinyl records. Immerse yourself with some new year. new you. journaling and conclude the evening with a vino tasting. Bring your favorite vinyl records and our DJ will play them on the turntable! Enjoy a gentle candlelight flow, inversion workshop and fall themed activities. Have you been wanting to go upside down or balance on your hands, but have not had the chance to practice? Here is your chance to play…the only rule is you have to fall before you can fly. Inversions are extremely fun and challenging. We will give you tools and guidance on how to practice your headstand / crow / inverted L pose / dolphin / firefly / handstand / bird of paradise…and so much more. Join us Saturday August 29th for GRATITUDE ON THE BEACH! $10 MINIMUM DONATION - INCLUDES YOGA CLASS, GUIDED MEDITATION, FRISBEE & MORE! Enjoy an evening of UNPLUGGING from devices to recharge the mind, body and spirit. Slow flow Yoga to Acoustic Music taught by Lisa Scurlock, followed by wine and social on a breathtaking rooftop in Chicago!